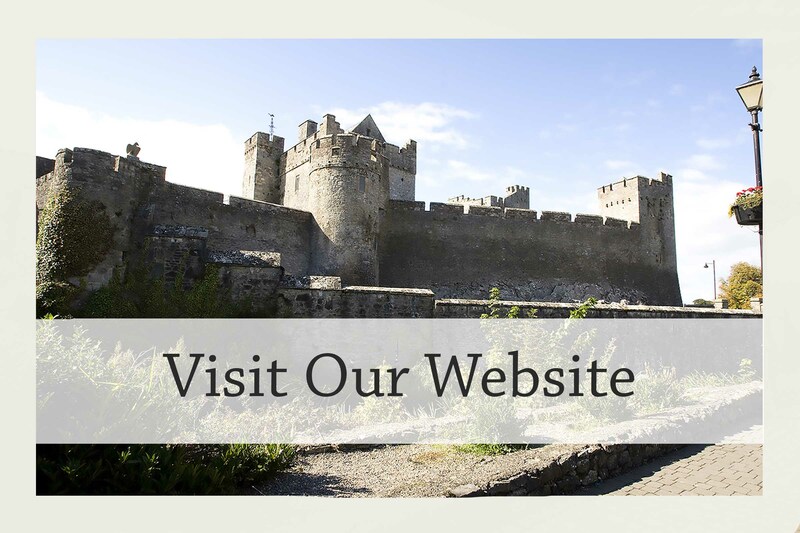 If you are interested in Castles to Visit in Ireland there are plenty but there are also some great castles in Ireland to stay in. 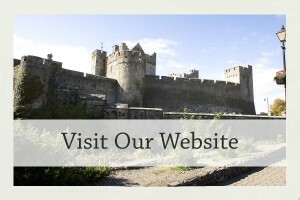 Many of them offering an authentic Castle experience. 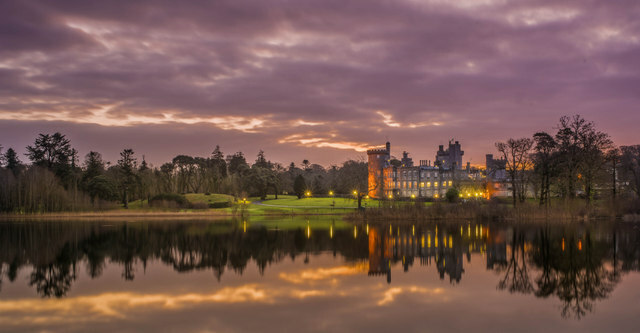 Dromoland Castle is one of the finest castles in Ireland to stay in, a 5-star luxury hotel located near Newmarket-on-Fergus in County Clare. 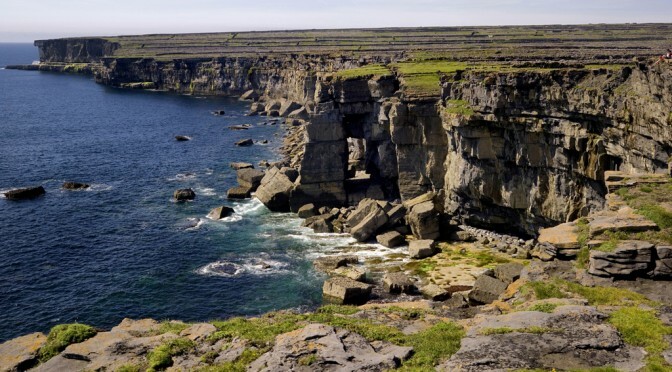 It was the ancestral home of the O’Briens, who are one of the few native Gaelic families of royal blood and direct descendants of Brian Boru, High King of Ireland in the eleventh century. 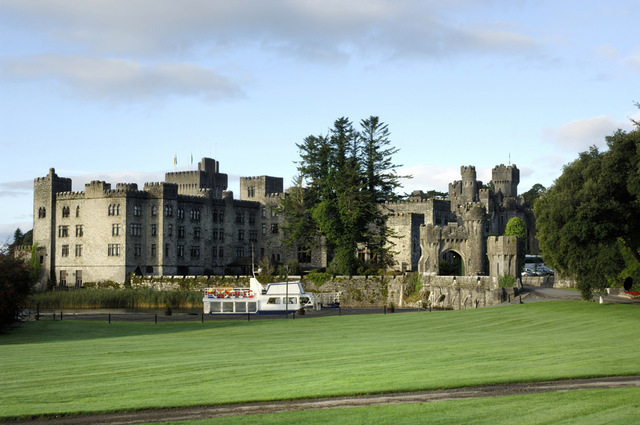 Ashford Castle is a medieval castle that has been extended over the centuries and turned into a 5-star luxury hotel near the village of Cong, on the shore of Lough Corrib. 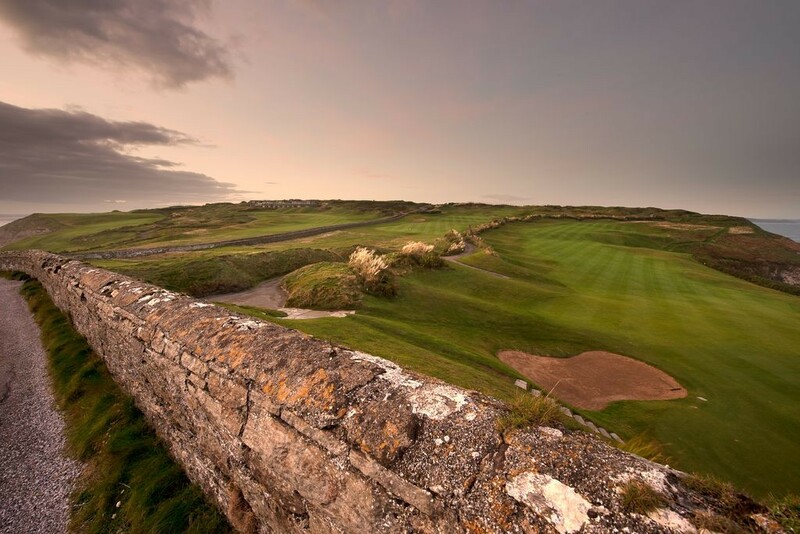 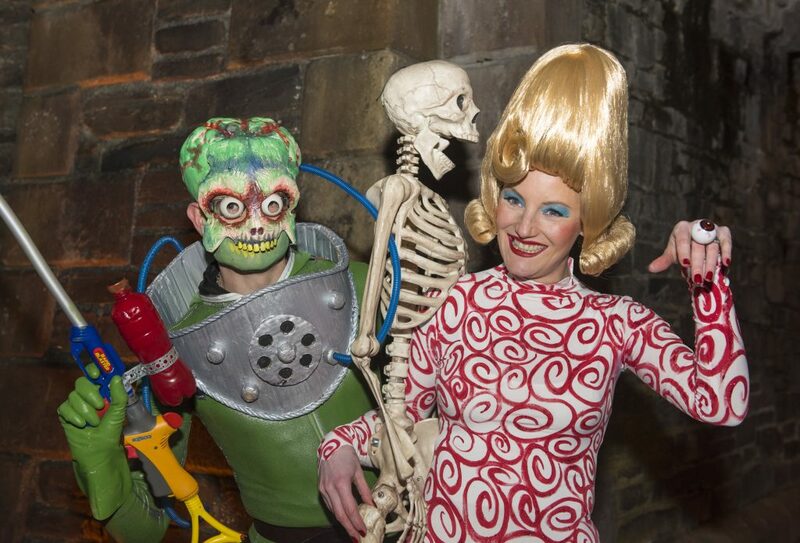 The castles history stretches back as far as 1228! 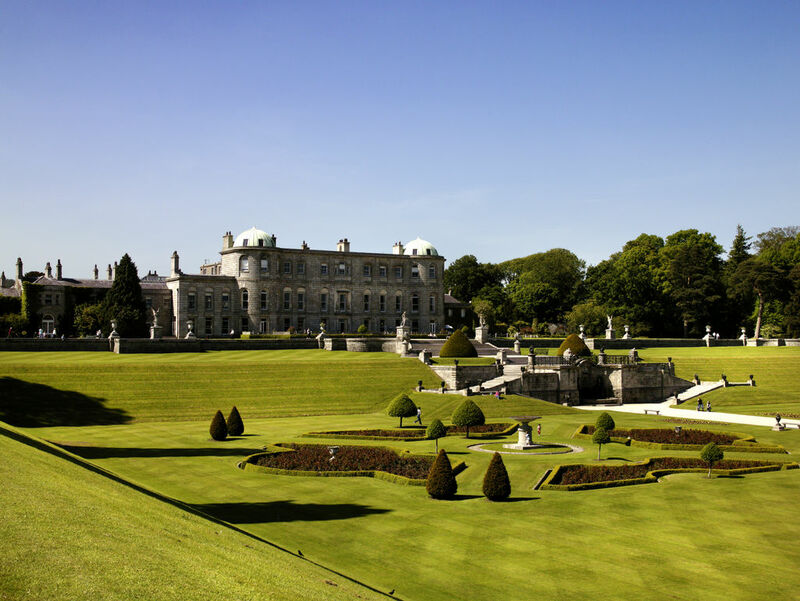 Adare Manor is a manor house located in the village of Adare, County Limerick. 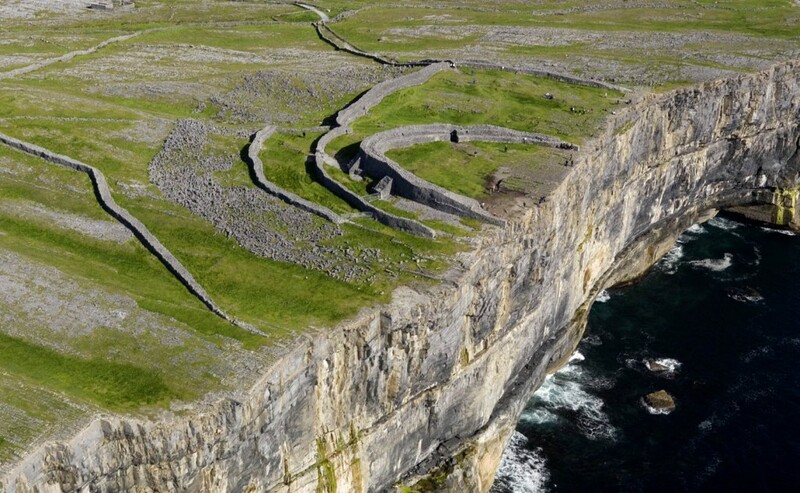 The Castle was the former seat of the Earl of Dunraven and Mount-Earl. 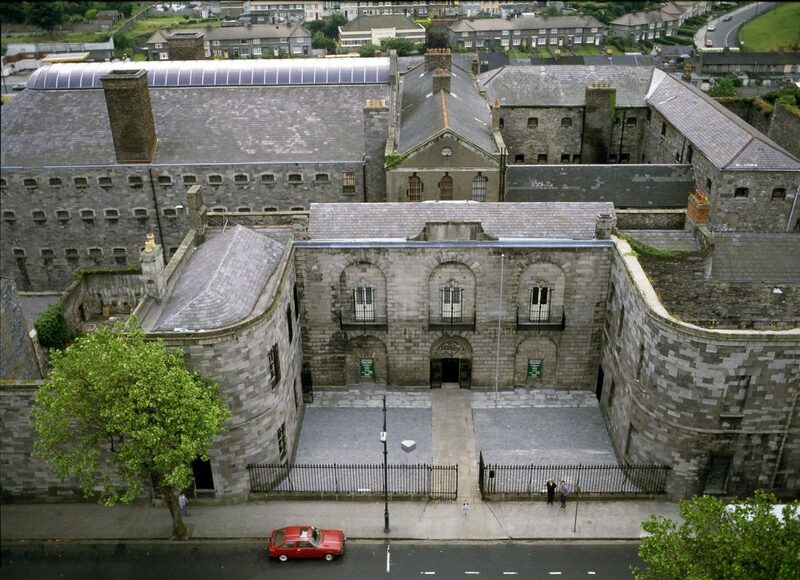 Although the present house was built in the early 19th-century, it retains some of the walls of the 17th-century structure. 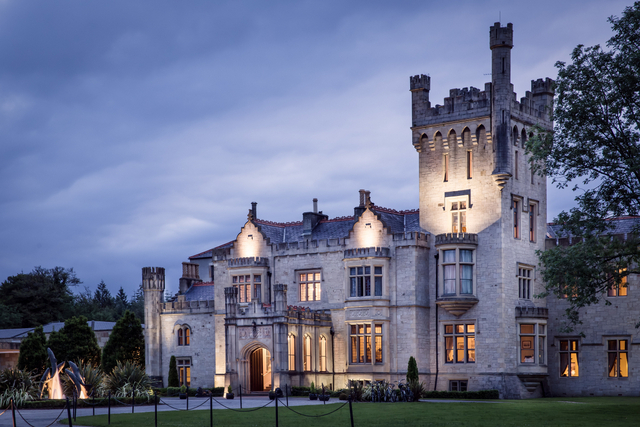 It is now the Adare Manor Hotel & Golf Resort, a luxury 5-Star resort hotel. 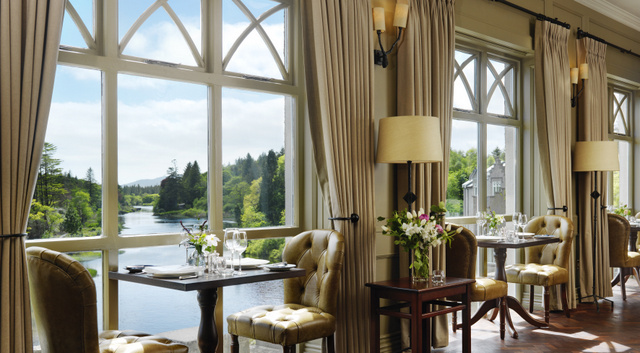 Ballynahinch Castle located in Recess in the wilds of Connemara has an interesting history – it was built at some point between the end of the 18th century and the first decade of the 19th and is now a luxury 4-Star hotel and one of the loveliest castles in Ireland to stay in. 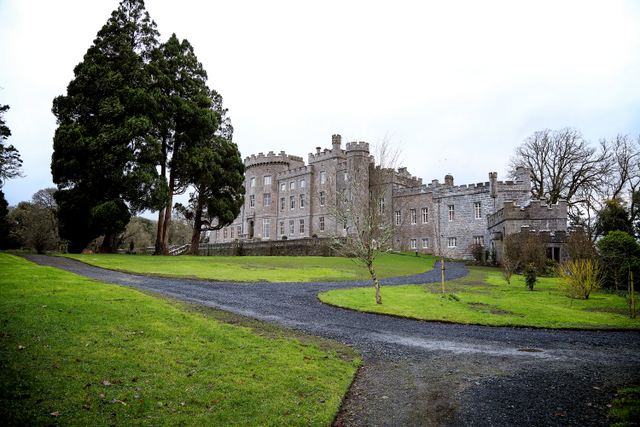 Markree Castle, in Collooney in County Sligo is the family seat of the Cooper family, partially moated by the River Unshin. Today it is a small family-run 4-Star hotel. 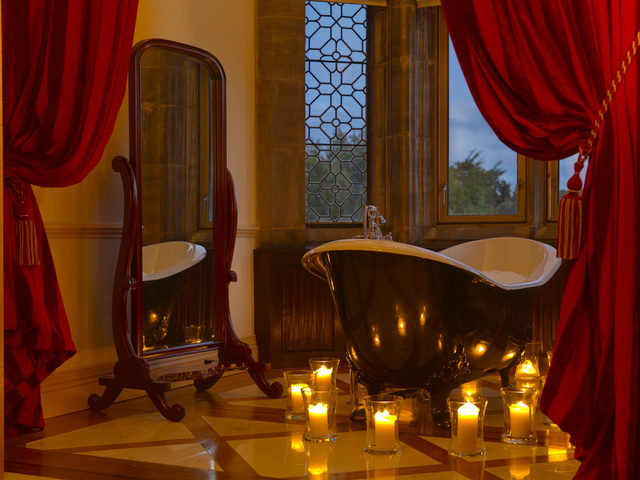 Lough Eske Castle is a 5-Star Castle Hotel near Lough Eske in County Donegal, Not far from Donegal Town. 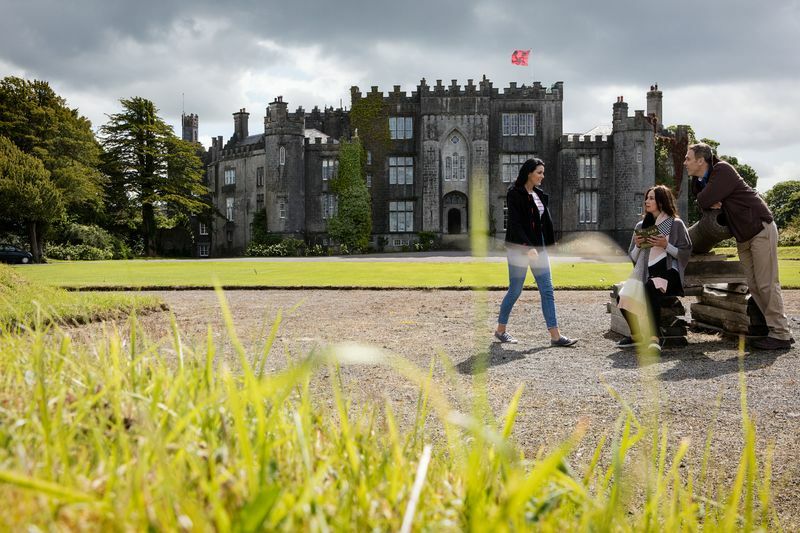 In 1861 the new Lough Eske Castle was built on the location of the old Brooke manor, which was itself a rebuilding of an original Jacobean house. 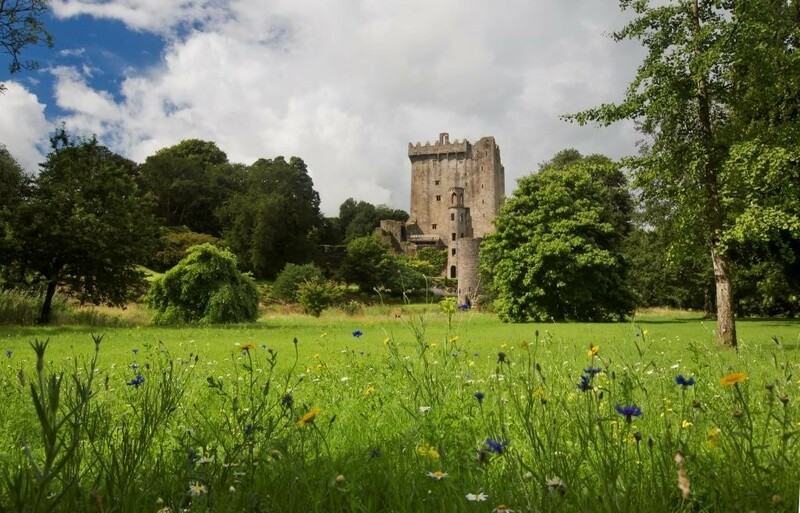 Waterford Castle is located on an enchanting Island surrounded by the River Suir and this site was the ancestral home of the Fitzgerald Family for 800 years. 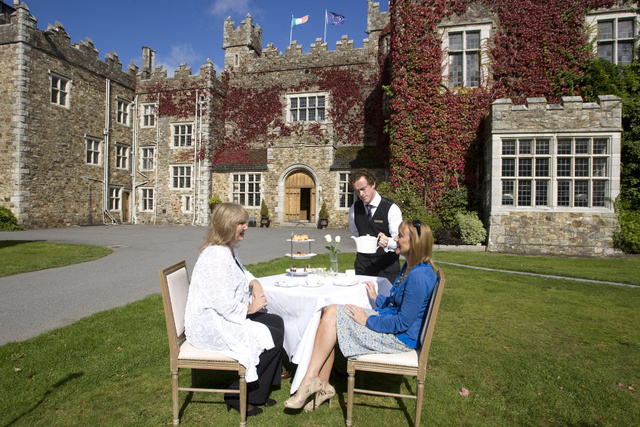 The castle is now a delightful 4-Star hotel and a great option for a castle stay in Ireland. 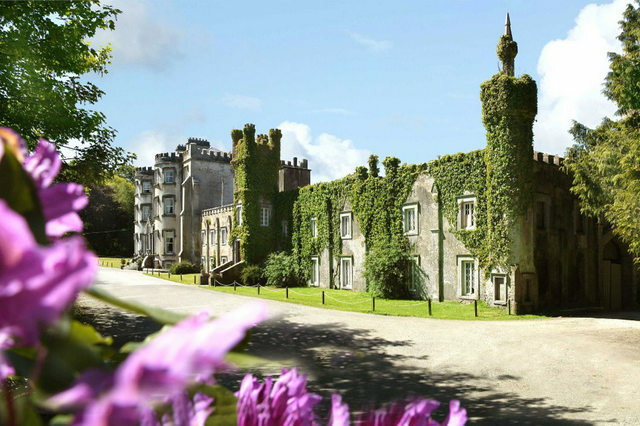 Ballyseede is a 4-Star Castle Hotel set on 30 acres of pasture and gardens, just a few minutes’ drive from the town Tralee. 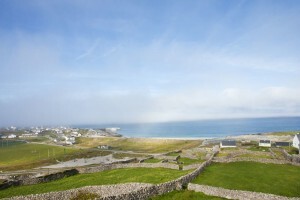 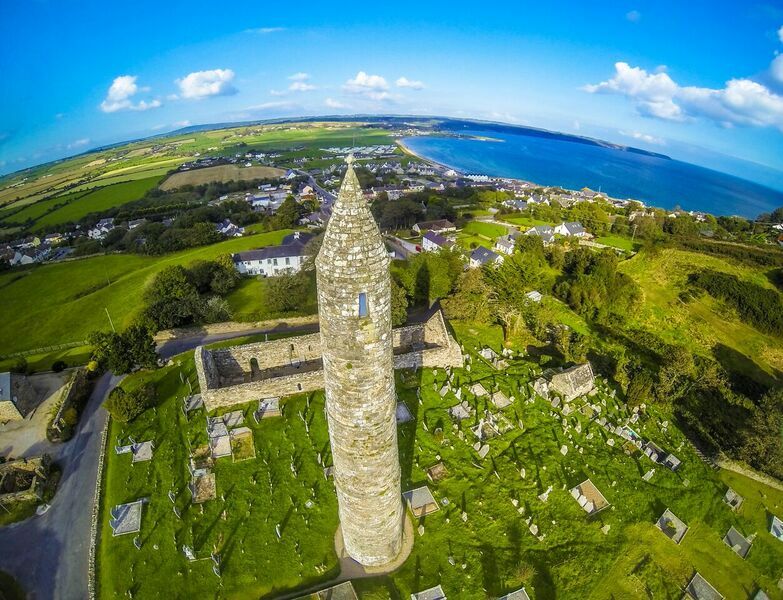 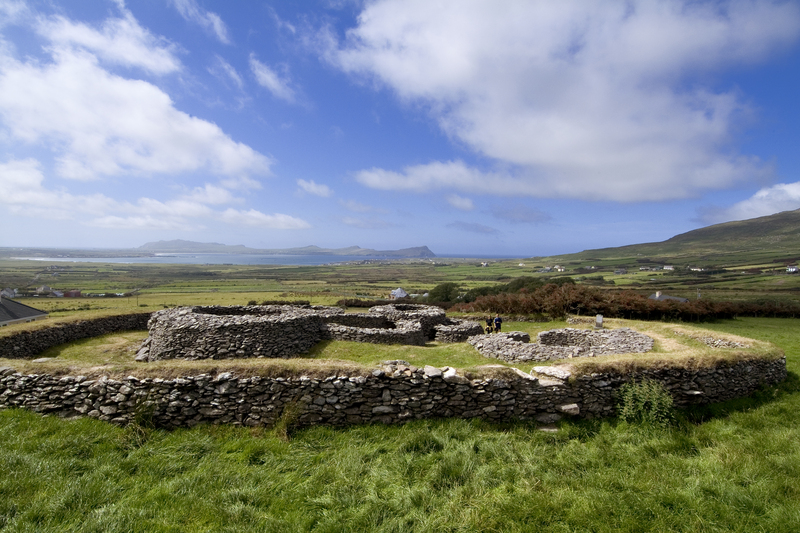 This castle is a great base to explore Ring of Kerry or Dingle Peninsula. 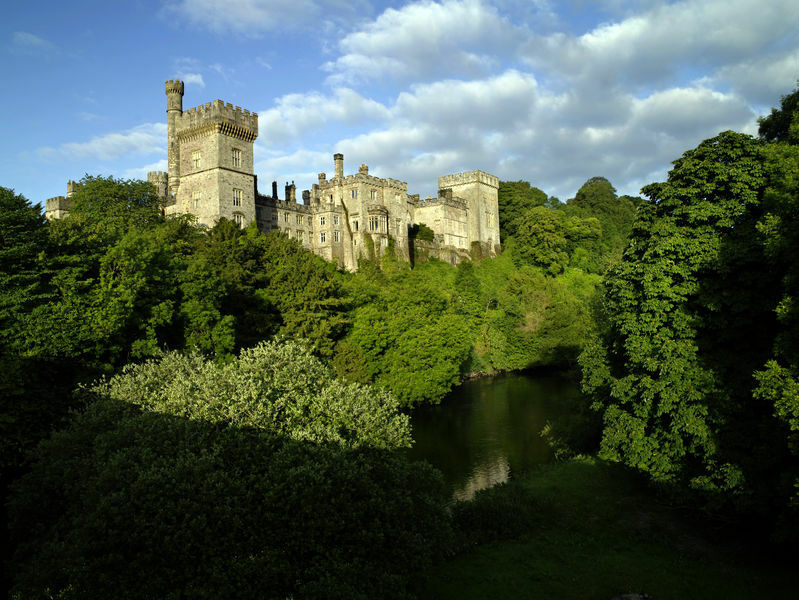 Kilronan Castle, known previously as Castle Tenison, sits on forty acres of parkland on the shore of Lough Meelagh in County Roscommon. 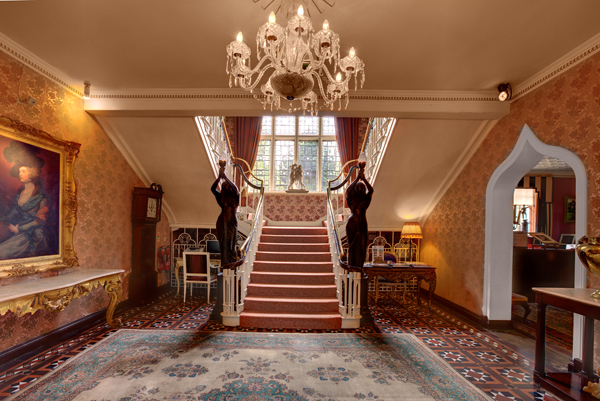 It is now a fantastic 4-Star hotel. 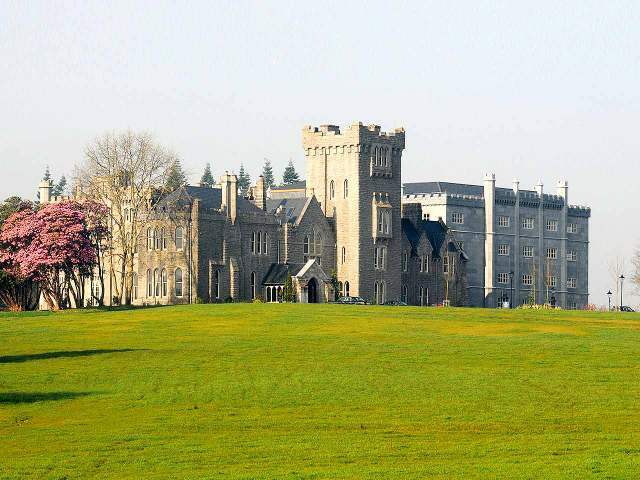 The 4-Star Cabra Castle in Kingscourt in County Cavan was constructed in the first decade of the 19th-century. 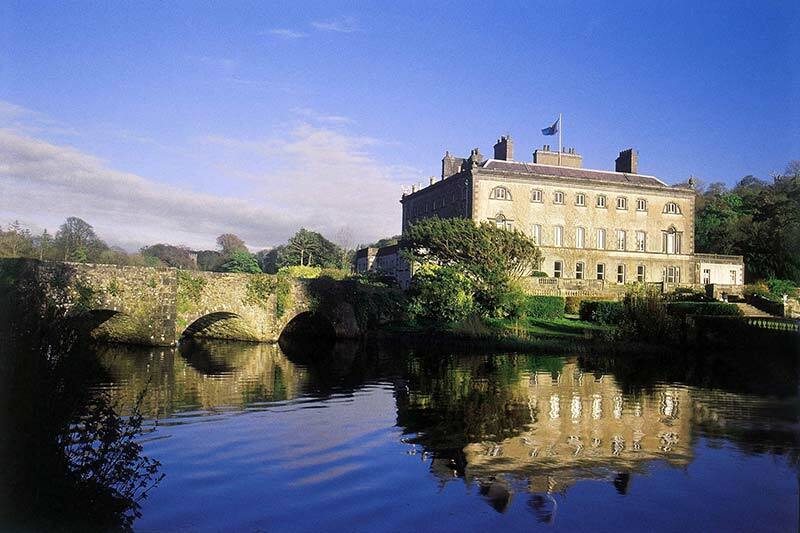 This building was formerly called Cormey Castle, after the local townland where it was built. 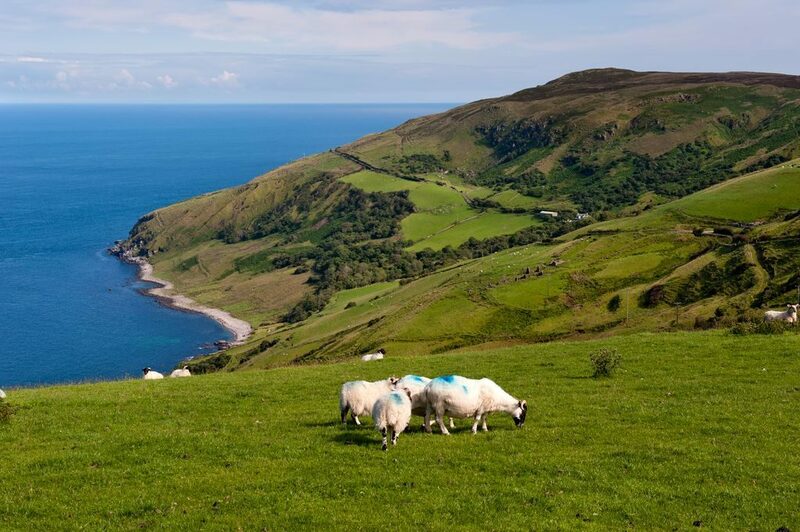 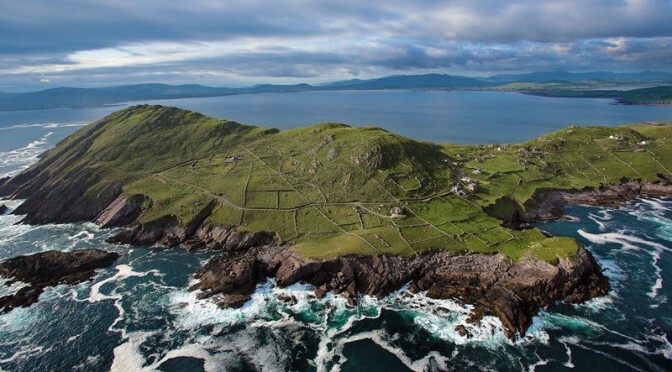 The Ring of Kerry, a 180km circular route around the Iveragh Peninsula in Ireland’s southwest, is quite possibly Ireland’s most well-known driving route. 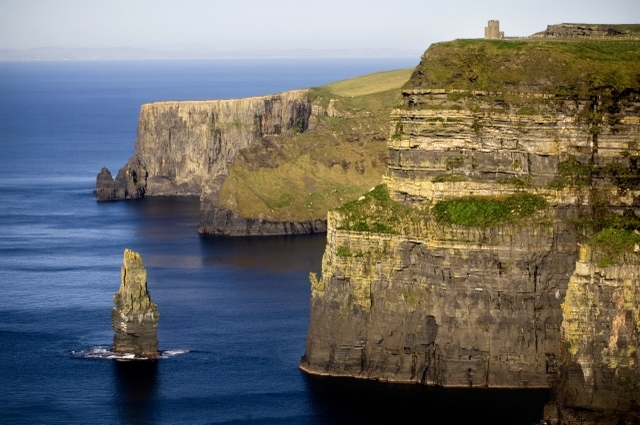 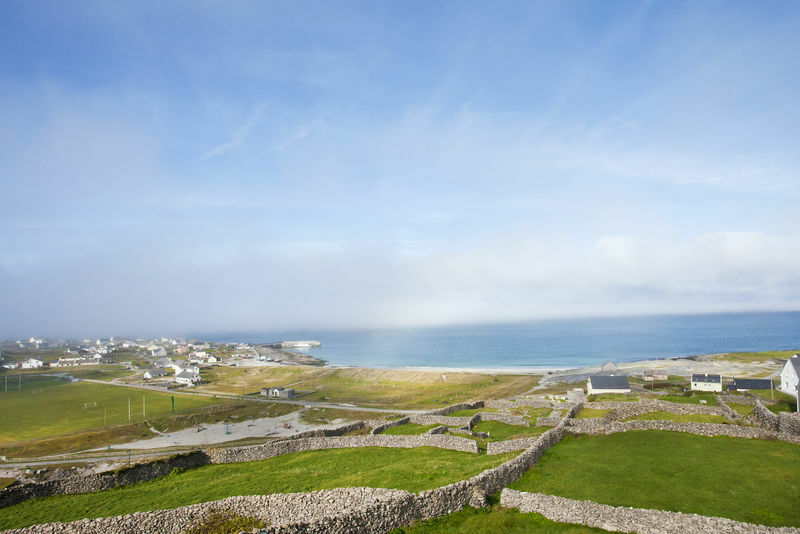 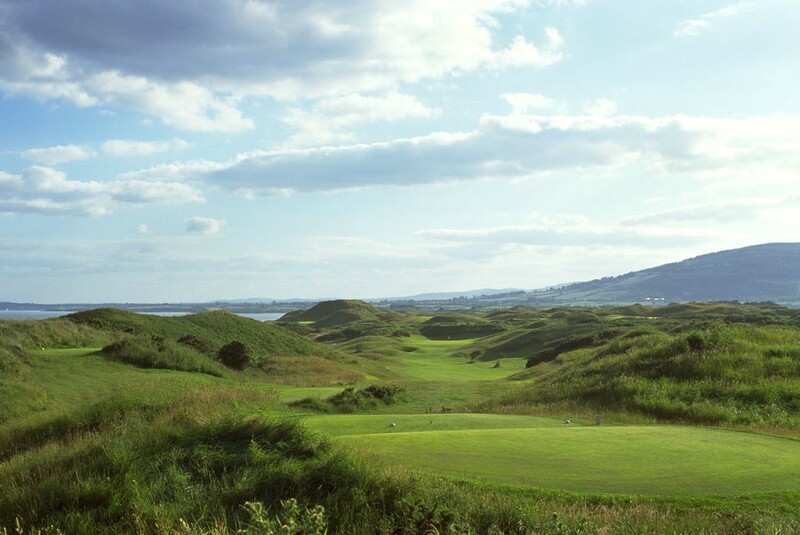 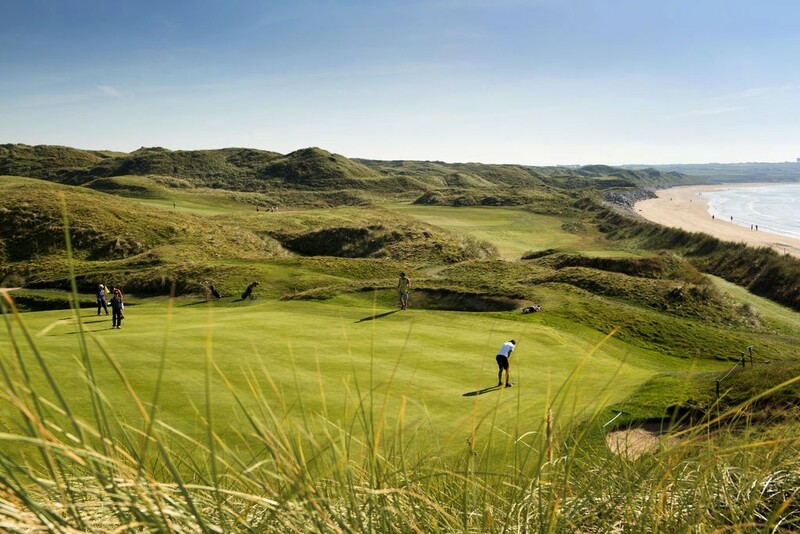 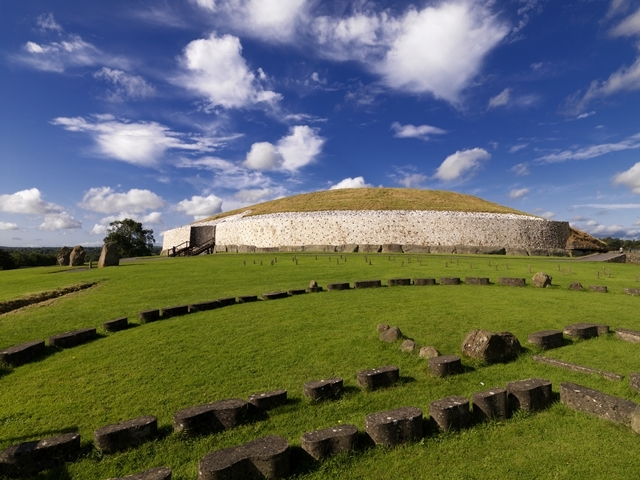 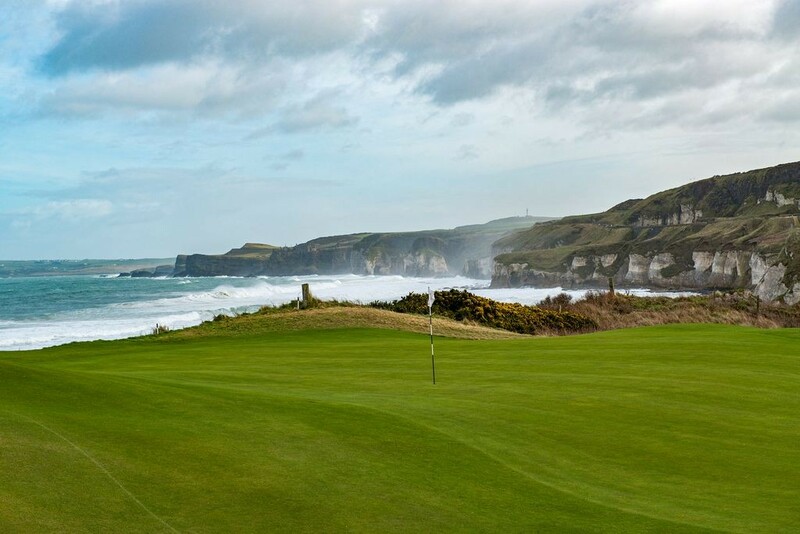 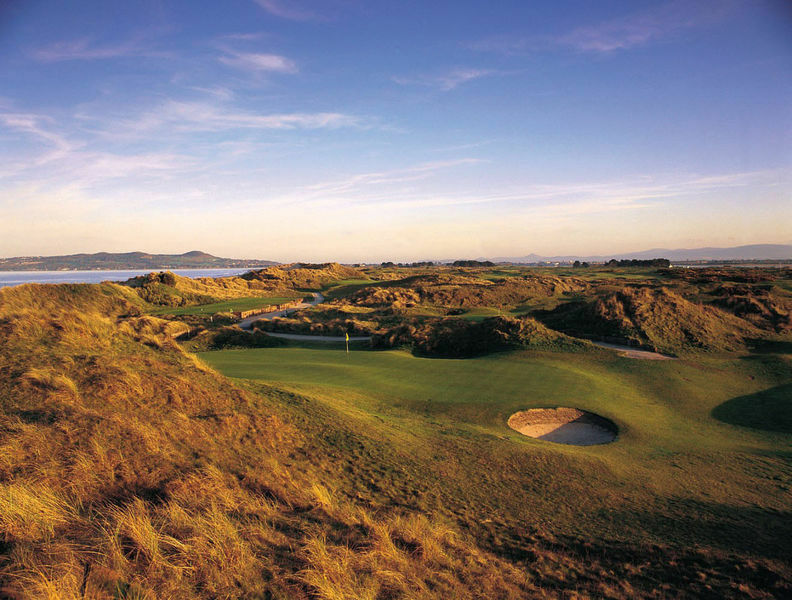 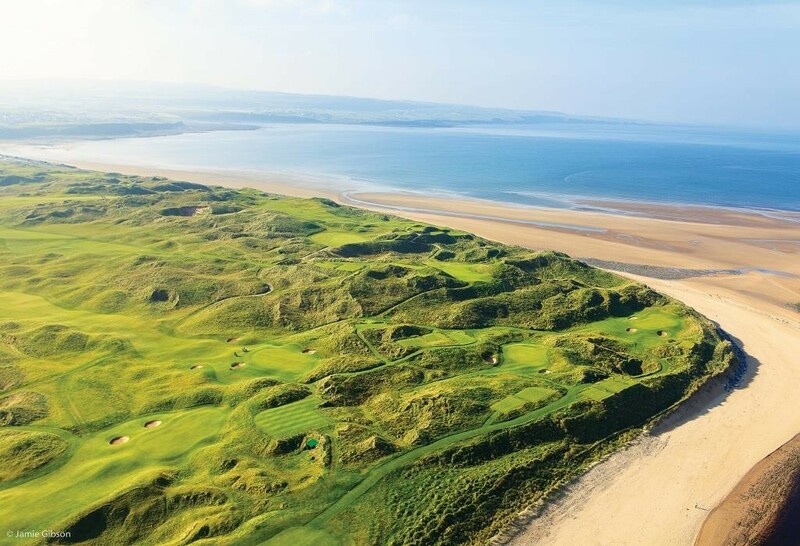 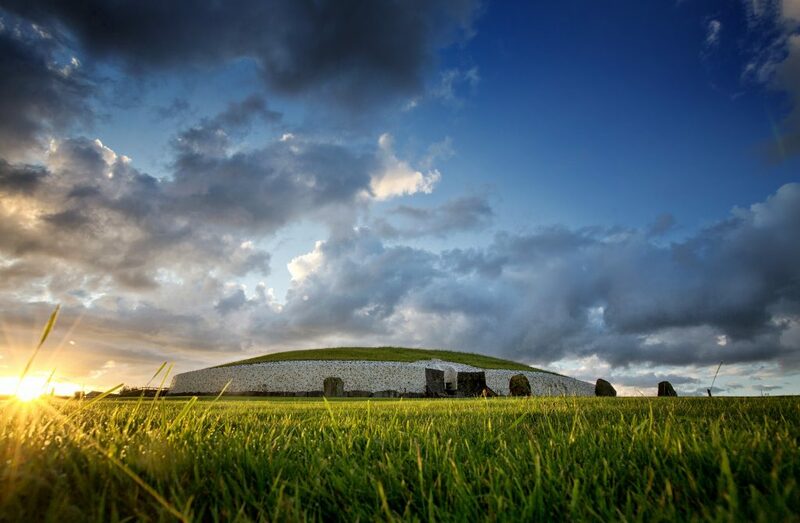 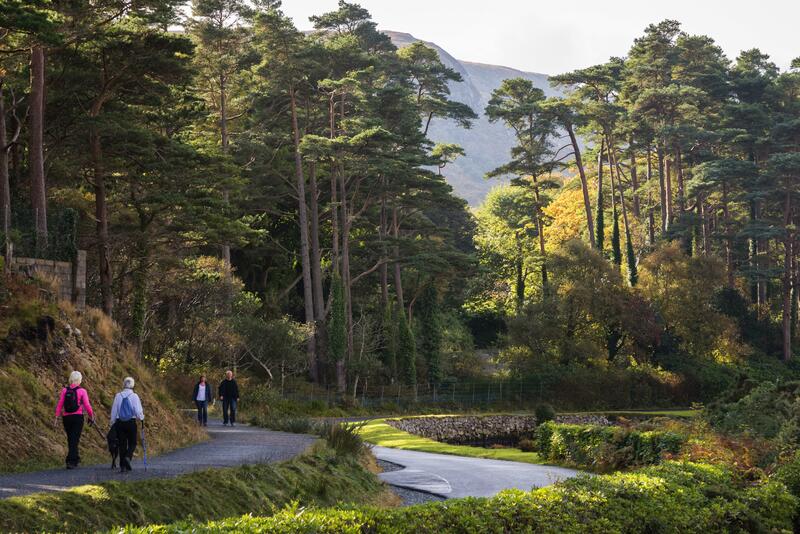 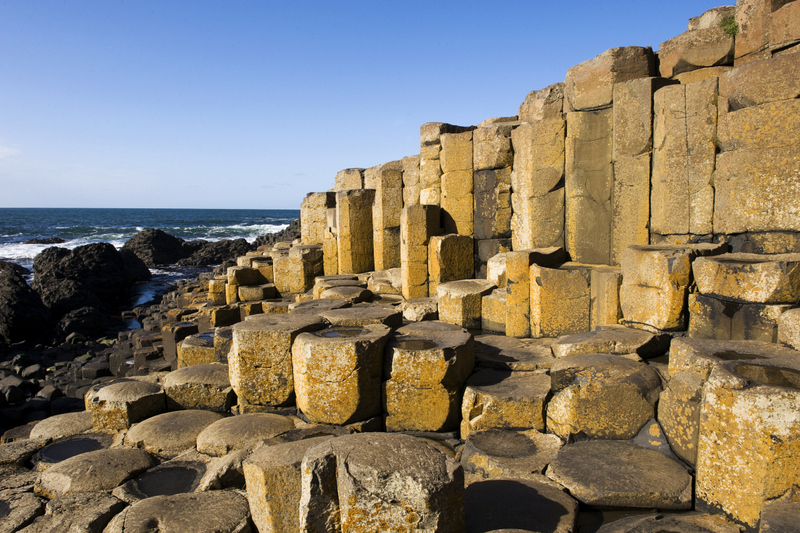 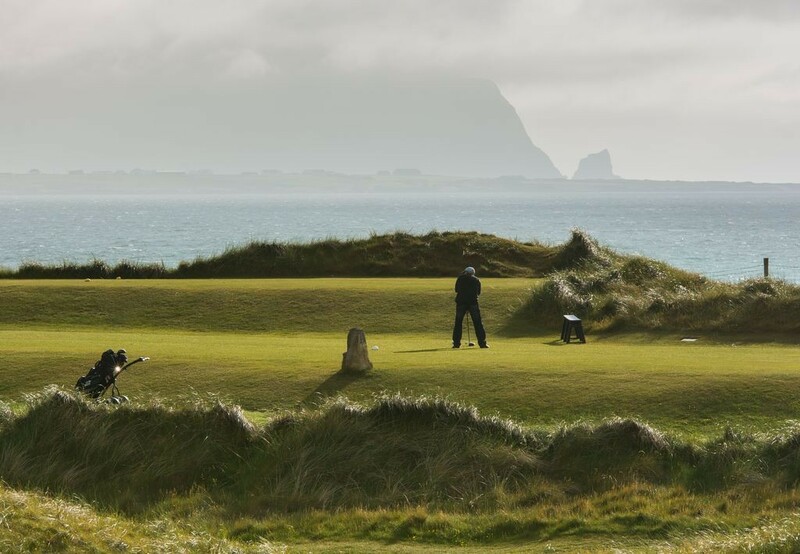 Superb Mountains and coastal settings combined with vibrant towns and villages will make this tour one of the highlights of your Ireland vacation. 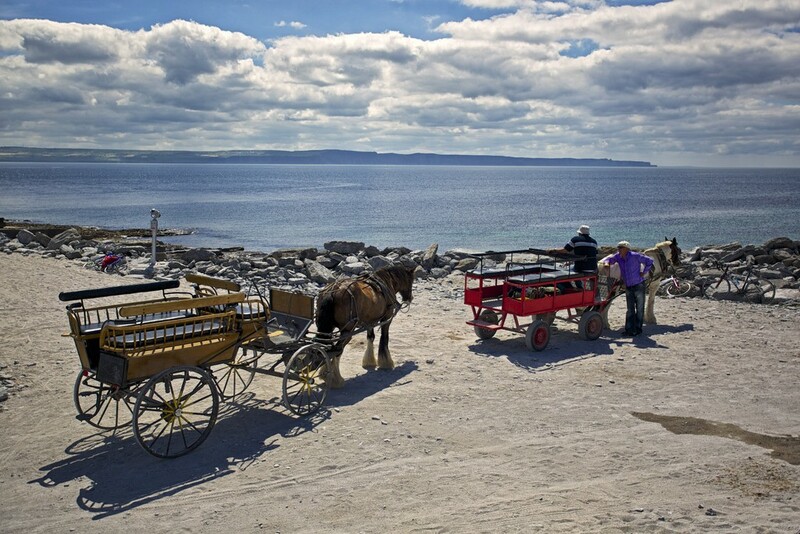 All of our Self Drive tours include a detailed suggested itinerary which will help you decide what to see or what to leave out. 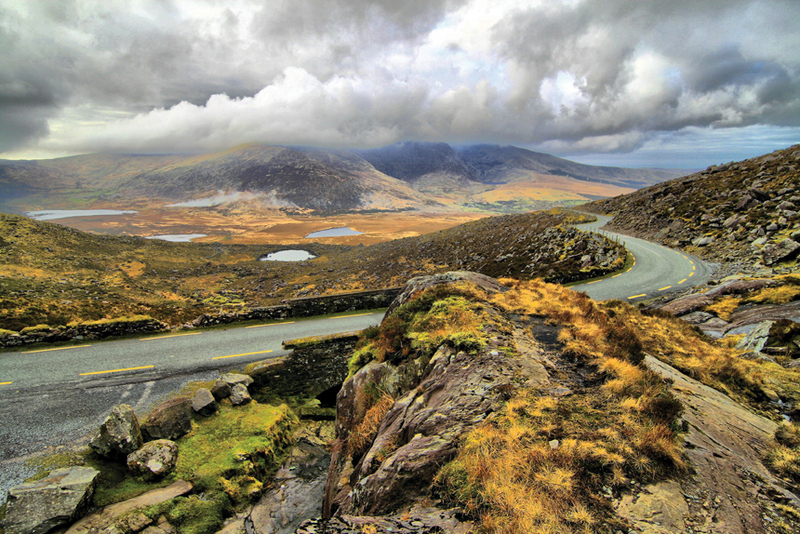 For those who wish to take a break from driving we can arrange a bus tour through this route. 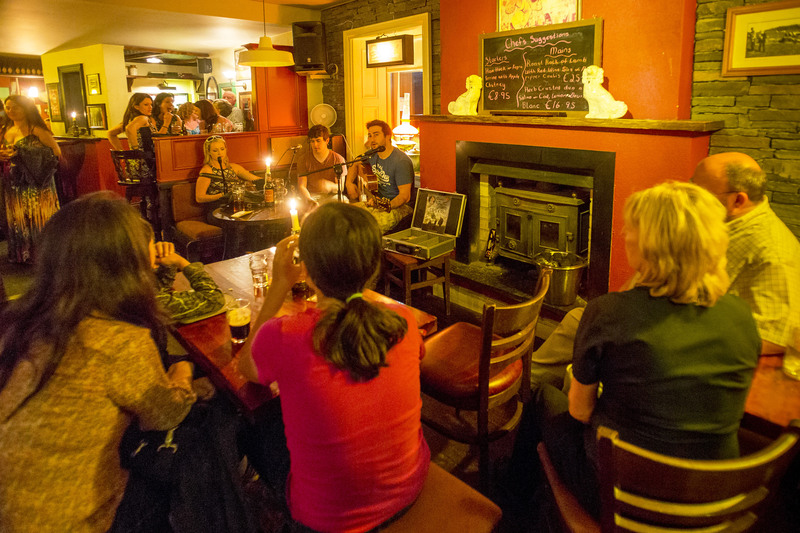 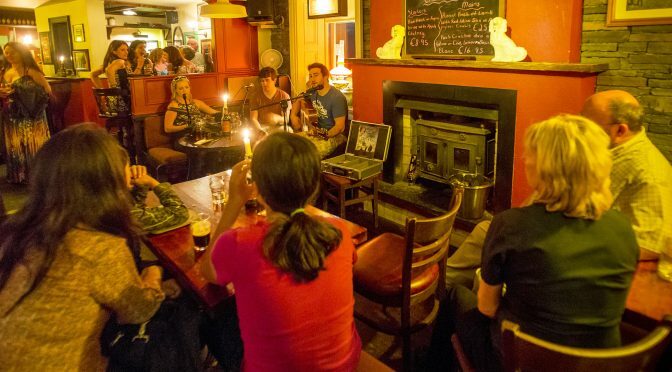 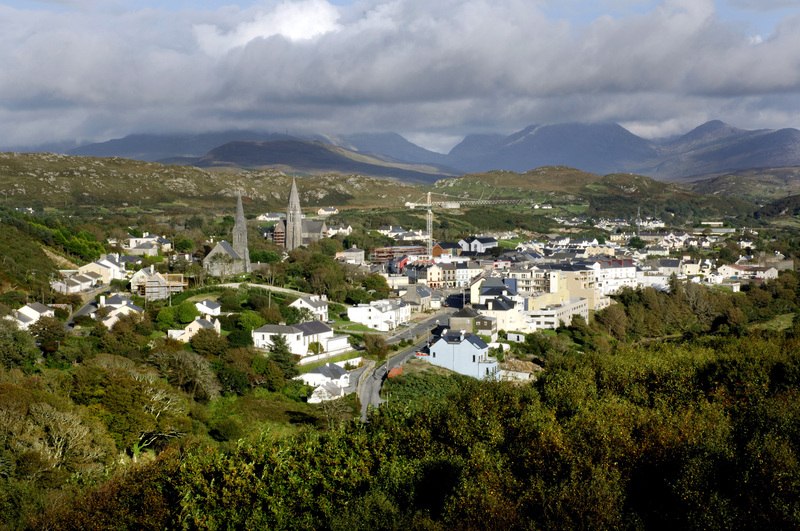 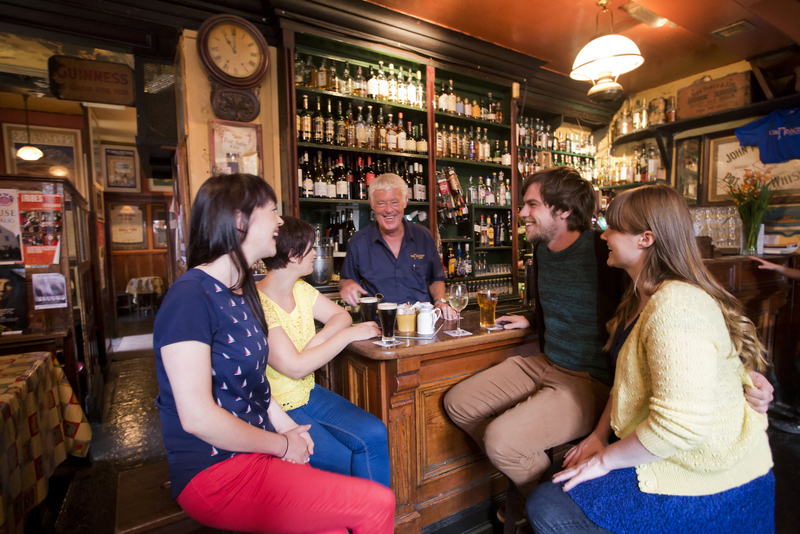 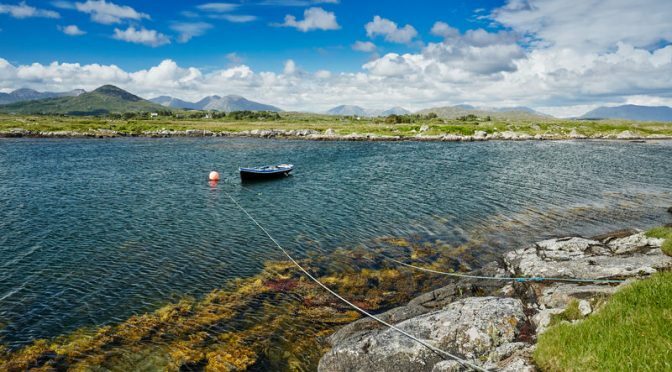 Killorglin is the first town you will meet when you begin your Ring of Kerry Adventure! 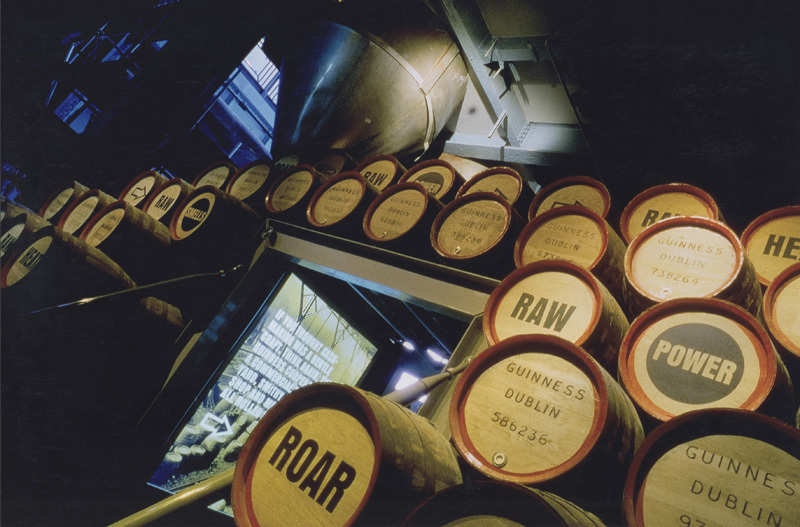 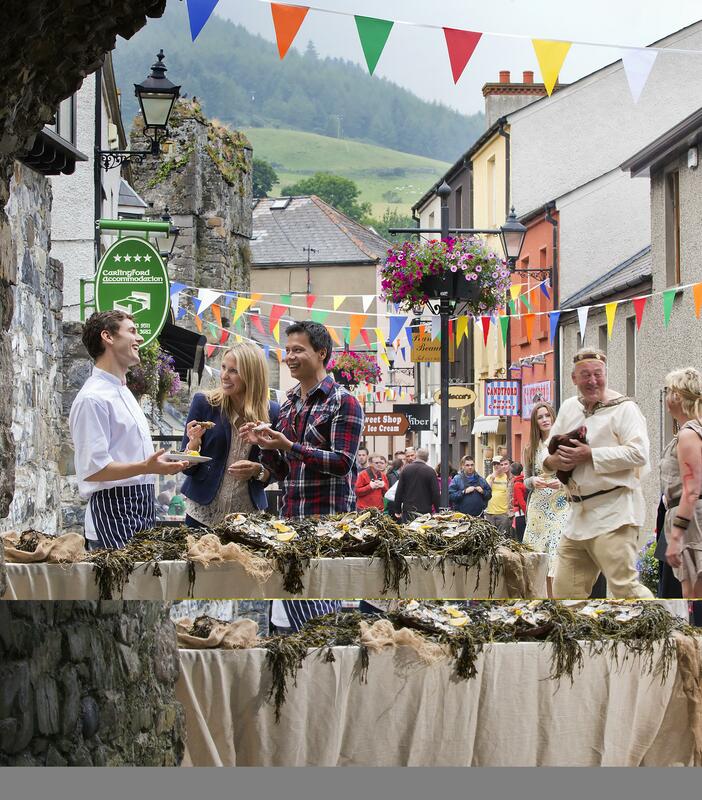 Home to the famous ‘Puck Fair’, Ireland’s largest and the world’s oldest market fair. 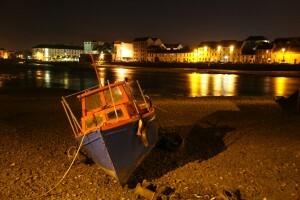 The town has some nice restaurants and shops and pretty riverside views. 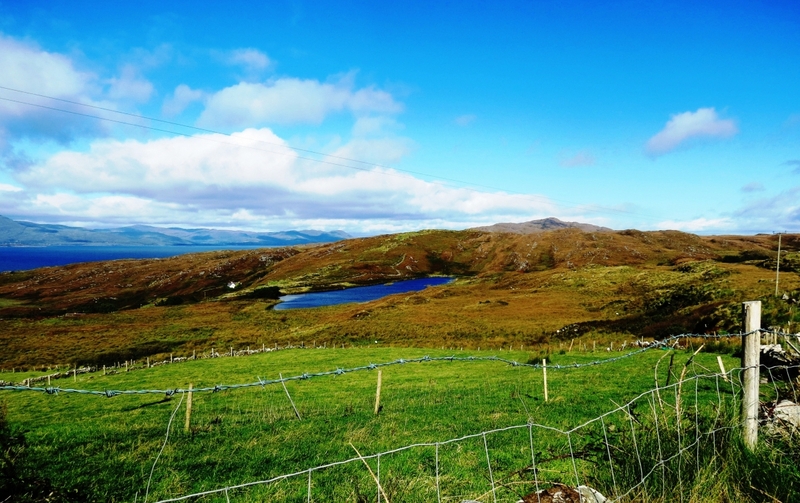 The mountainous backdrop here is glorious, and the half circle of hills from Seefin to Drung Hill, nicknamed the “Glenbeigh Horseshoe” is one of Kerry’s finest mountain walks. 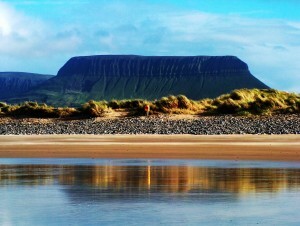 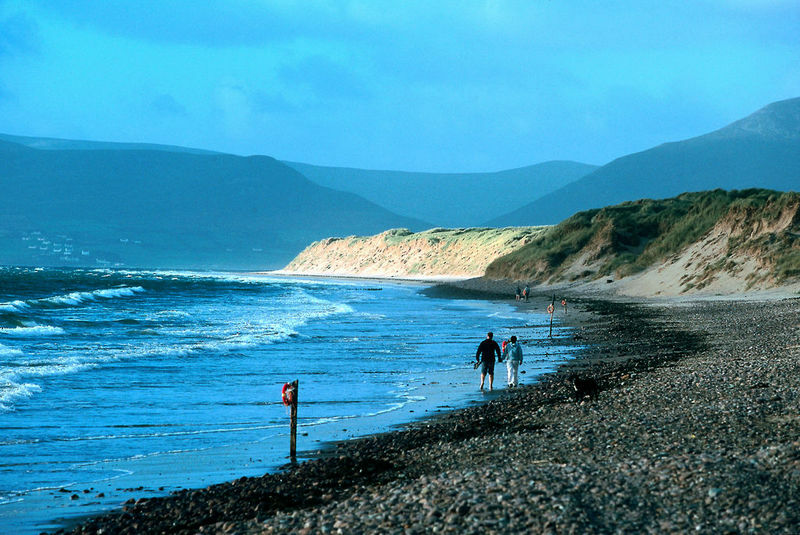 Near to Glenbeigh Village you will find Rosbeigh Beach with its lovely sand dunes and shale walks. 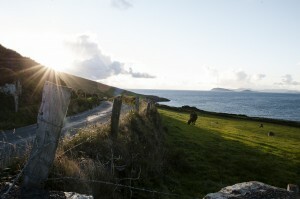 This is the principal town on the Ring of Kerry and birthplace of the famous Catholic Emancipator Daniel O’ Connell. 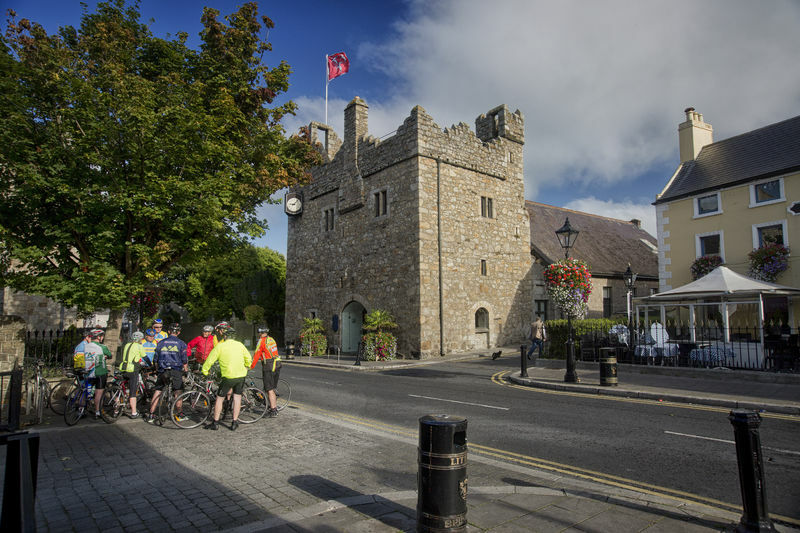 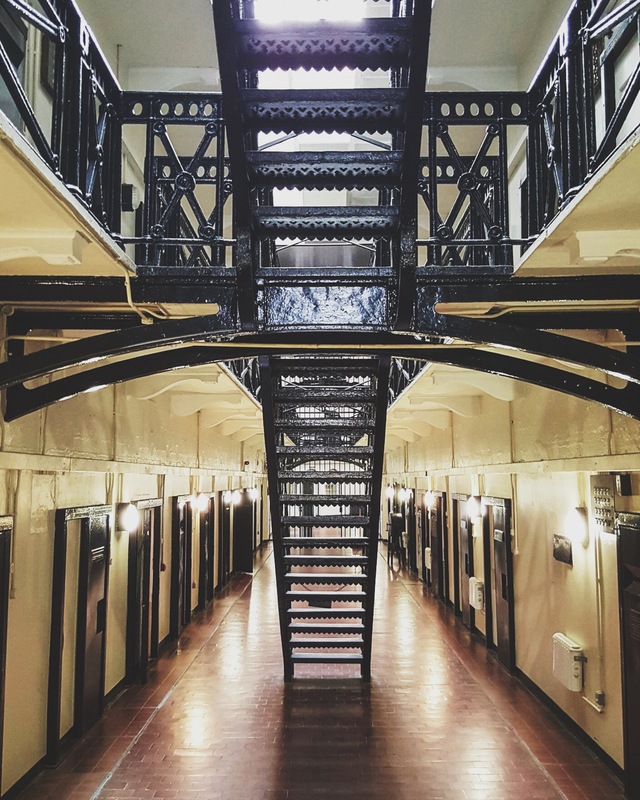 Pay a visit to ‘The Barracks’, Cahersiveen Heritage Centre which gives an insight into the life and times of Cahersiveen. 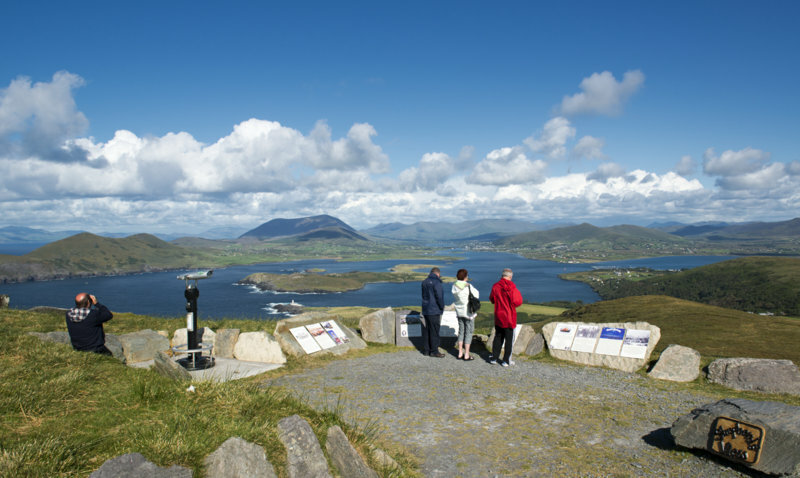 You can reach Valentia by the car ferry from Cahersiveen from April to October. 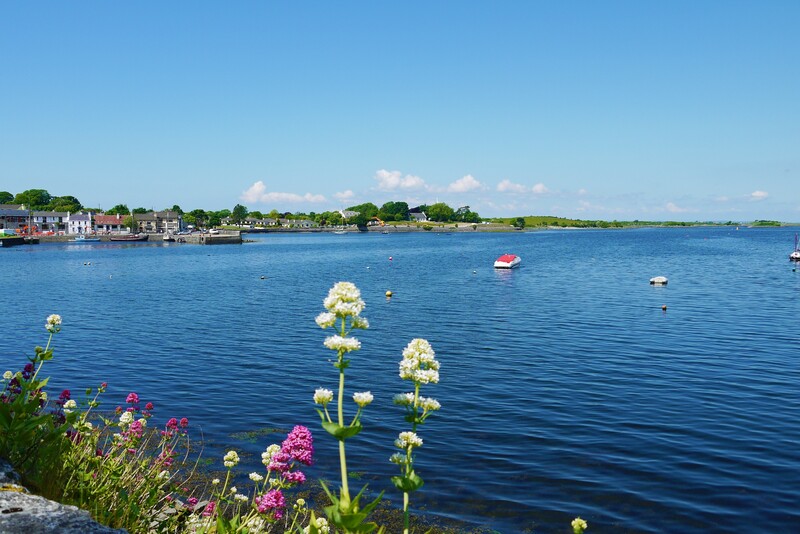 Outside of this time take the bridge across to the island from the pretty harbour village of Portmagee. 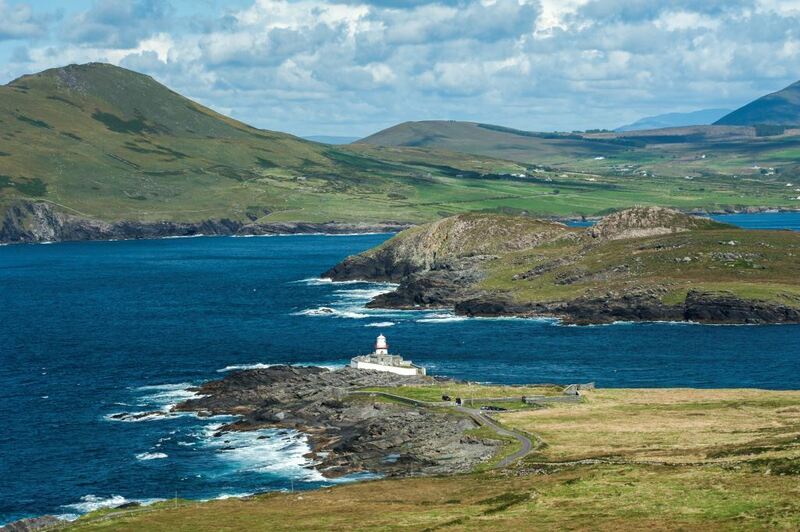 There are a few places to visit on the island including the village of Knighstown with its beautiful period buildings, Valentia Island Lighthouse and Geokaun Mountain & Fogher Cliffs; Valentia’s highest point and a superb spot to enjoy 360 degree views of the island and beyond! Skellig Michael also known as the Great Skellig is a UNESCO World Heritage Site. 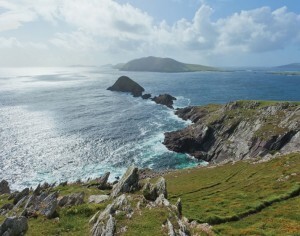 The island was featured in Star Wars: Episode VII – The Force Awakens. 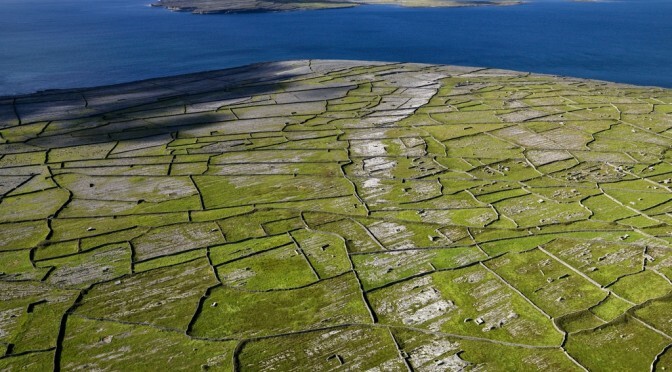 At the summit of the 230m high rock there is a 6th century Christian monastery and stone beehive huts which the monks who inhabited the island lived in. 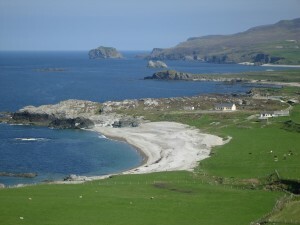 Boat trips to the islands can be taken from Portmagee pier. 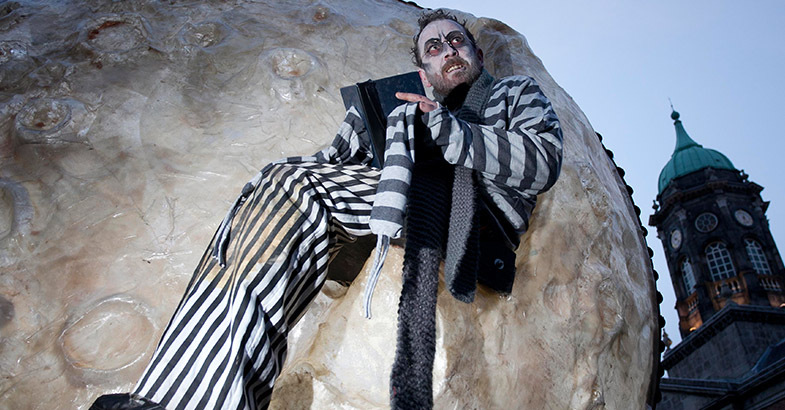 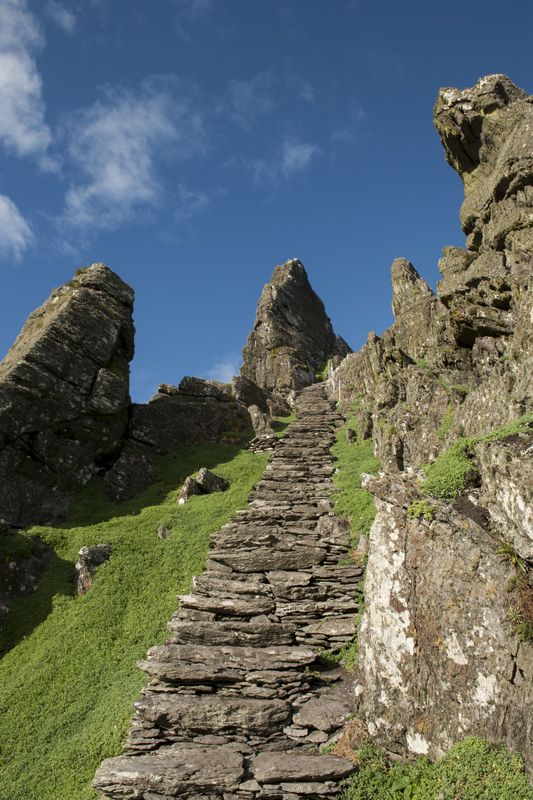 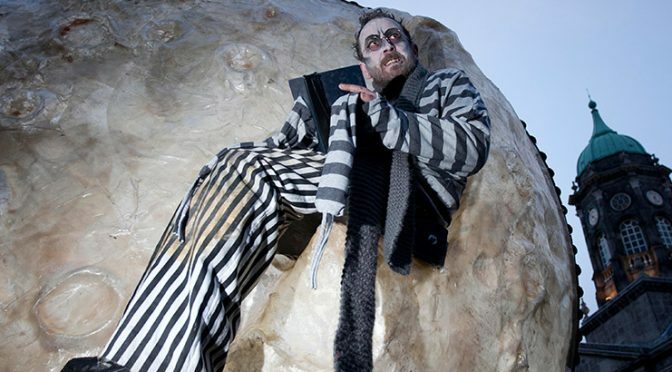 Trips to Skellig are not for the feint hearted however as there are 670 stone steps to climb before you reach the top! 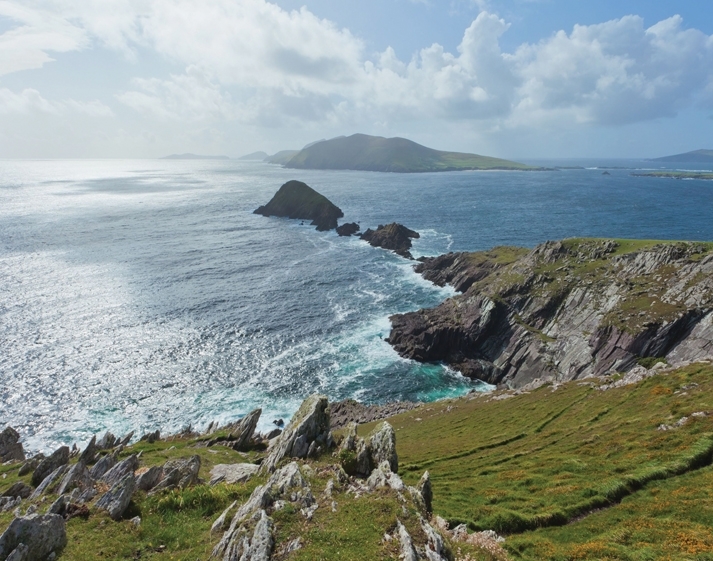 You can learn more about the Skelligs at the Skellig Island Visitor Experience which is located on Valentia Island near the bridge across to Portmagee. 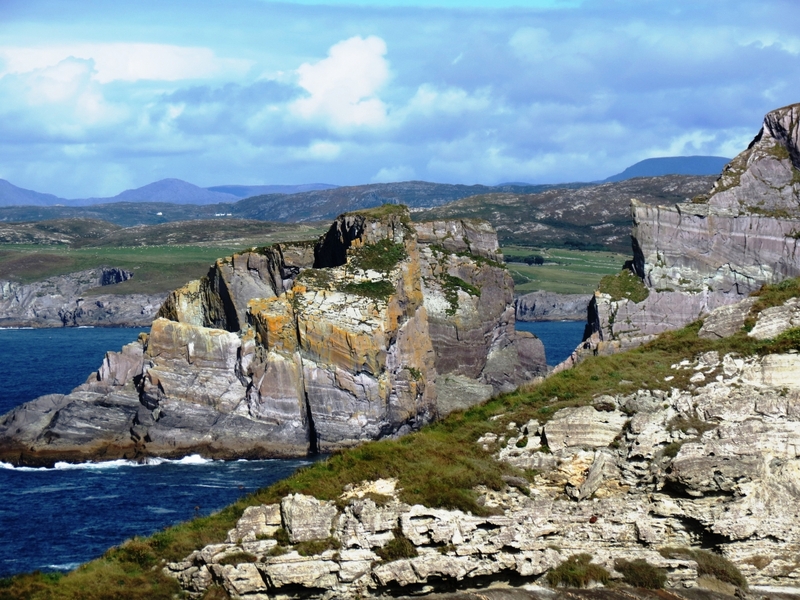 Ballinskelligs or “Baile na Sceilge” is one of the few remaining Irish speaking areas in this region of Kerry. 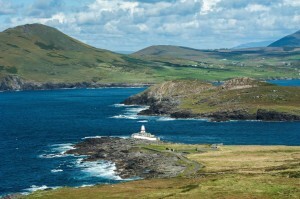 Southwest of the village you will find Bolus Head, which looks over St. Finan’s Bay and the Skelligs. 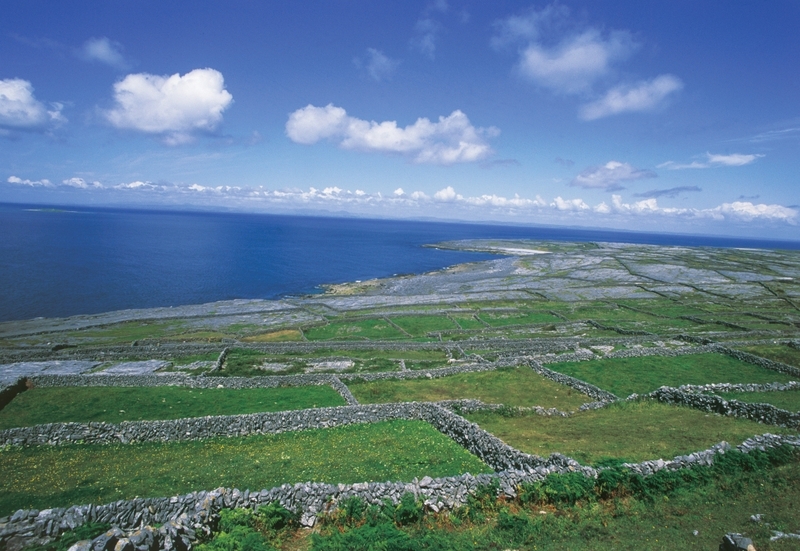 The ruins of Cill Rialiag, an early Christian monastic settlement are located nearby. 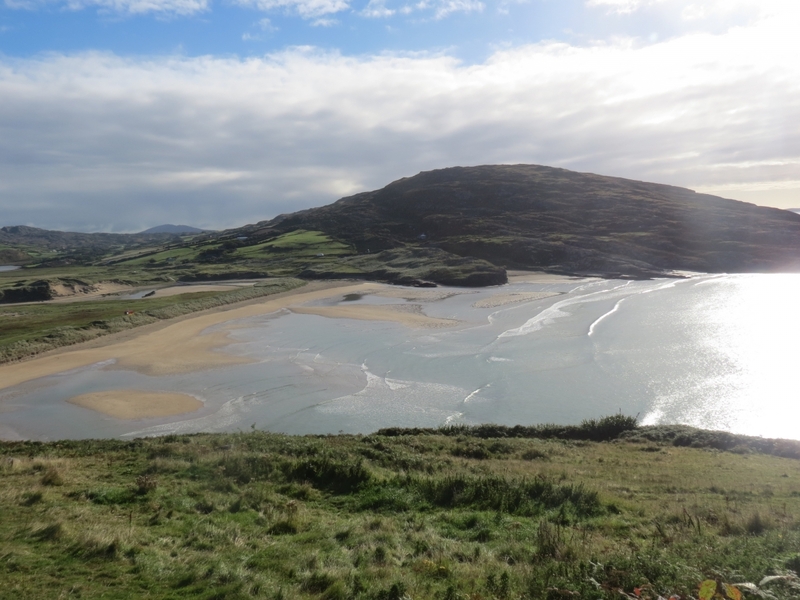 Ballinskellig Beach known locally as Ladies Beach is a stunning place to relax or take a long beach walk! 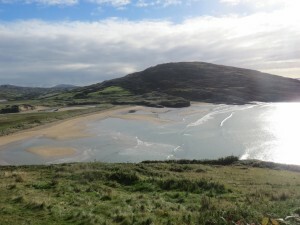 Waterville is a lovely little village overlooking stunning Ballinskelligs Bay and nestled on the beautiful Lake Currane. 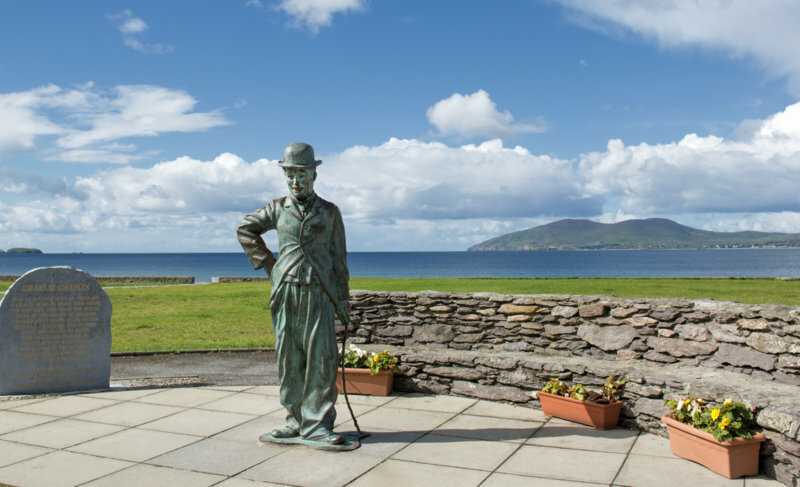 The town was a favourite holiday spot of Charlie Chaplin and his family who used to holiday here. 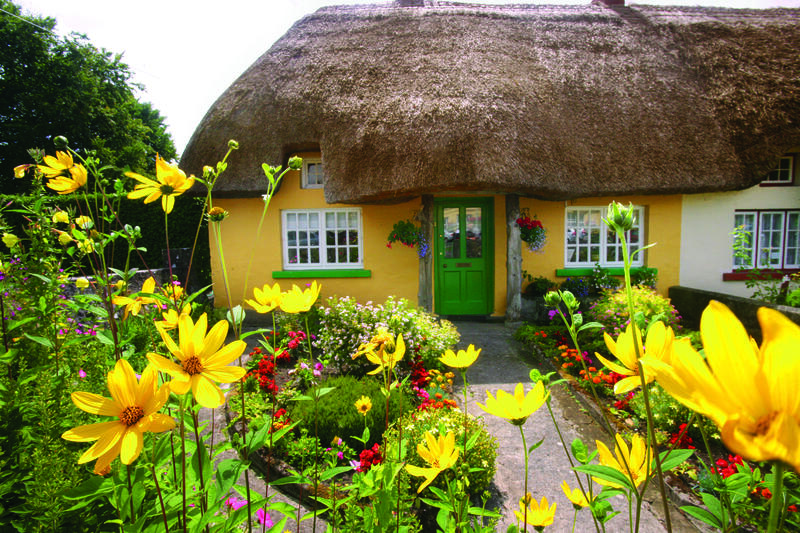 They first visited the town in 1959 and came back every year for over ten years. 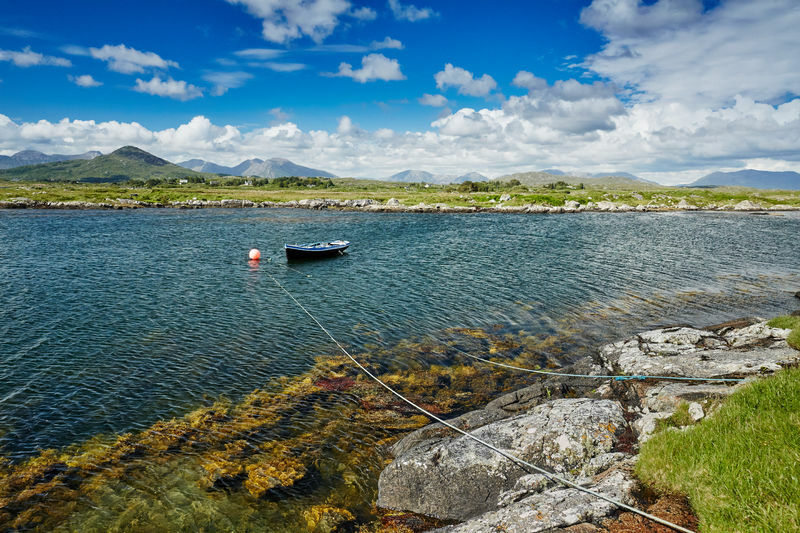 Caherdaniel is small but striking and perhaps set in one of the most scenic locations on the Ring of Kerry, on the shore of Derrynane Bay. 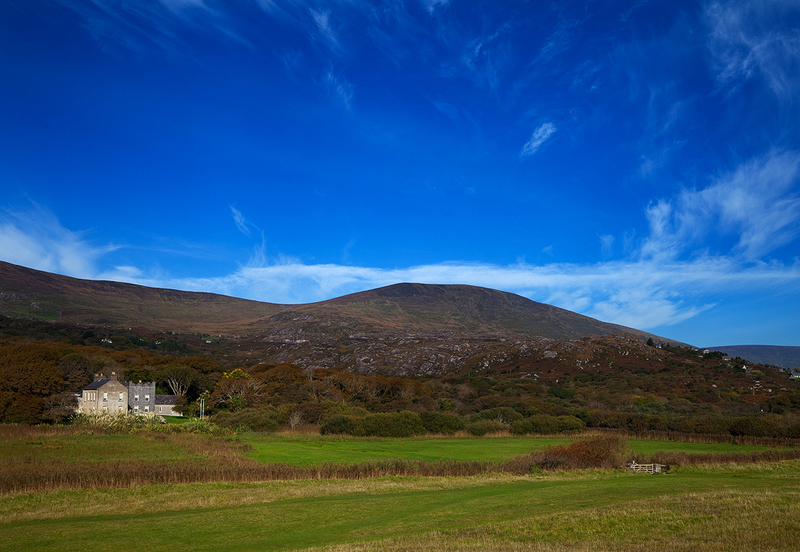 Derrynane House is the ancestral home of Daniel O’ Connell, a 19th century politician who achieved Catholic emancipation for the Irish people. 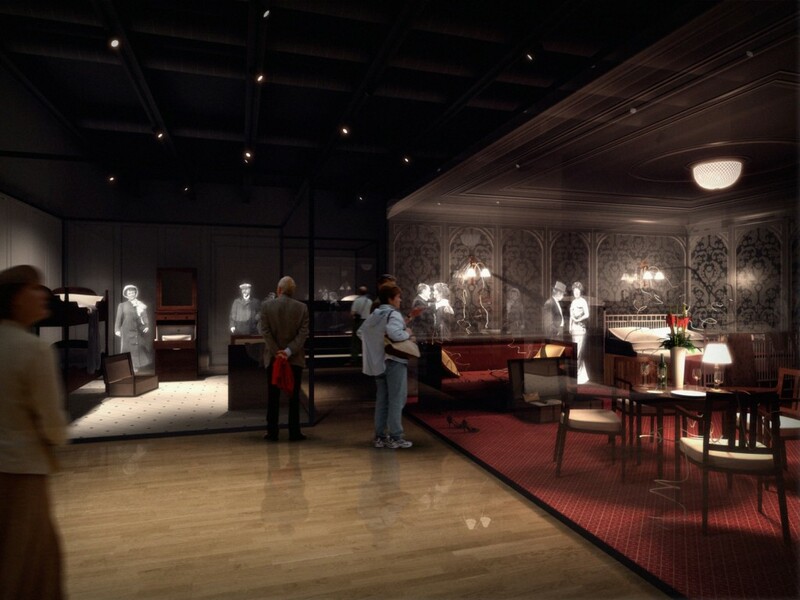 The house is now a public museum. 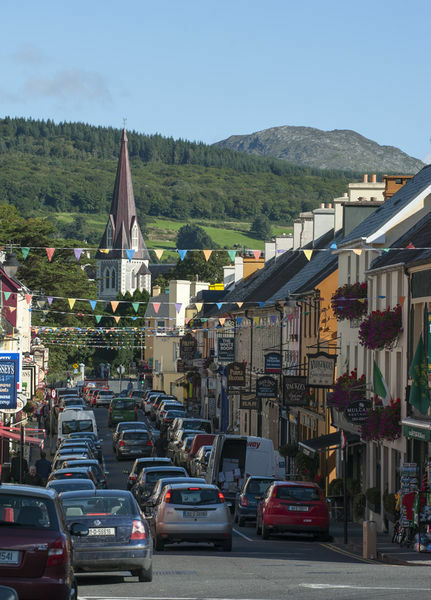 Kenmare town was founded in 1670 by Sir William Petty and has a history of lace making, demonstrations of which can be seen at the town’s Heritage Centre. 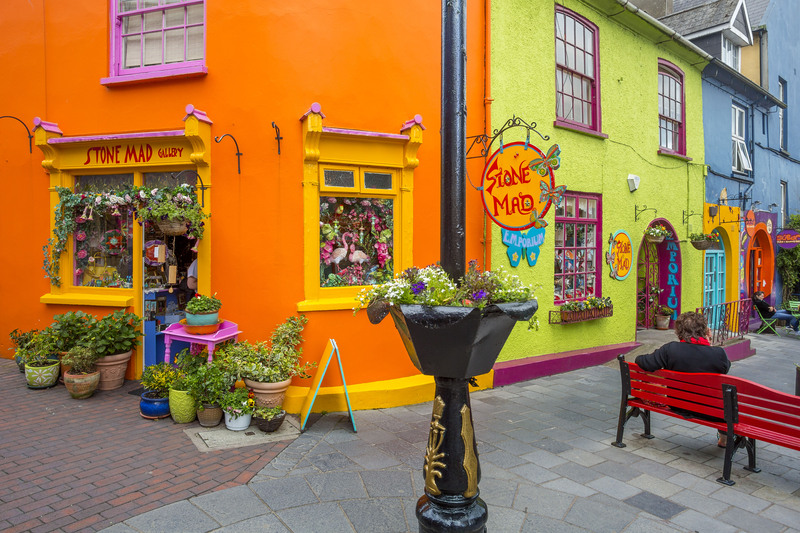 One of the most striking features of the town is its colourfully painted houses and shops. 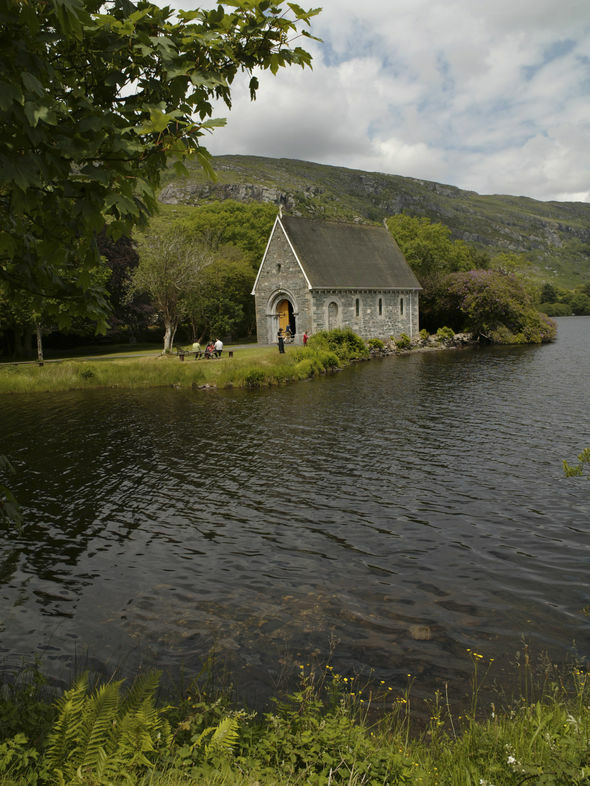 There are lots of nice restaurants, pubs and craft shops here also. Moll’s Gap is a pass on the road from Kenmare to Killarney. 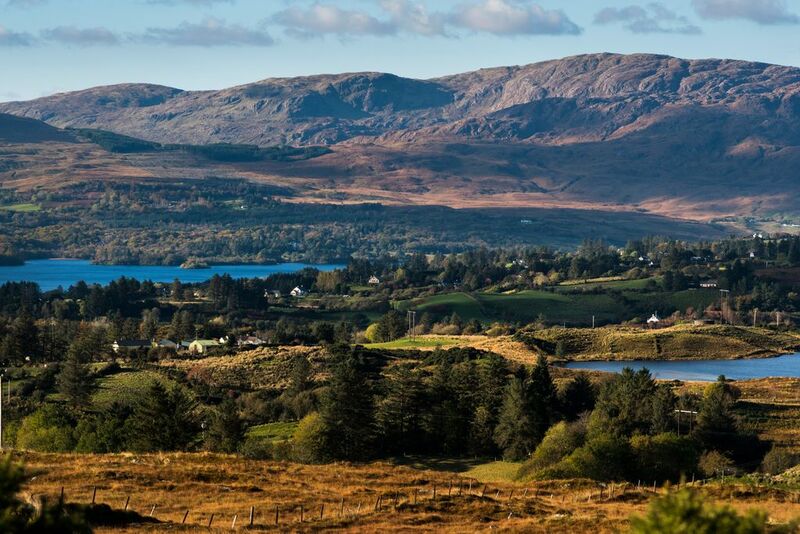 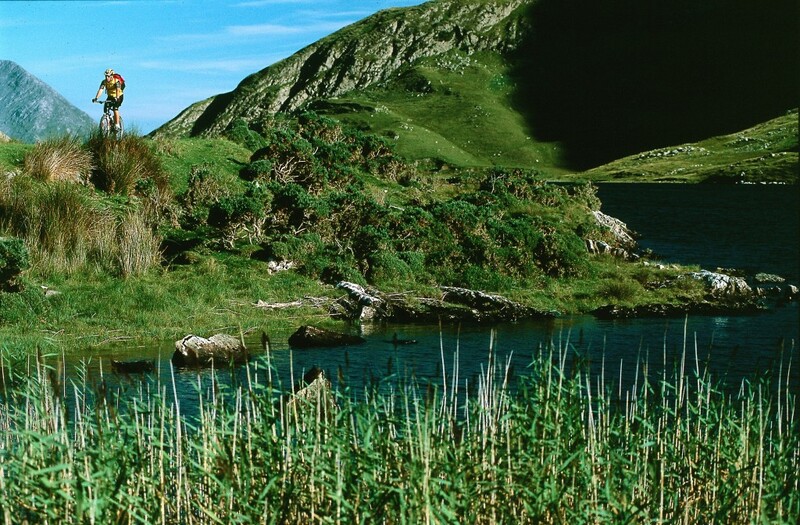 Here you will find unrivalled views of the Macgillycuddy’s Reeks Mountains. 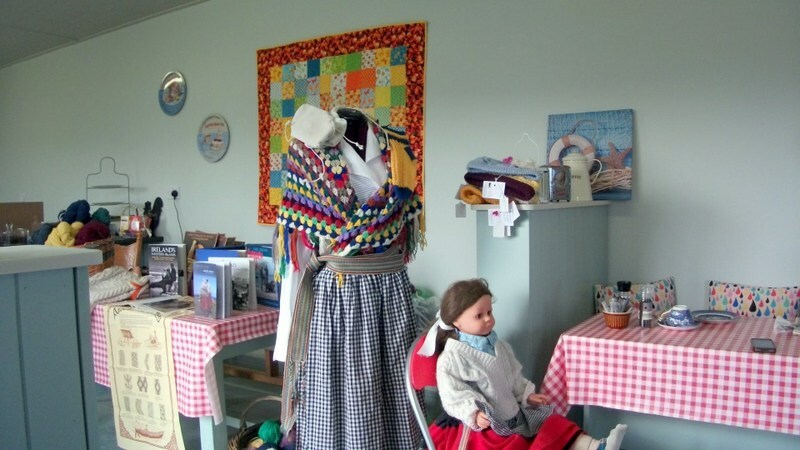 Nearby you will find Avoca Handweavers which sells Irish giftware and local food produce.